Visit the legendary Distillery nestled in the picturesque Nassau Valley on Jamaica's South Coast. Sample our freshly pressed cane juice and learn about the historical production of the world famous Appleton Rum. 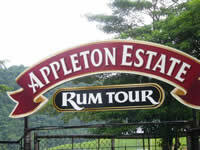 The Appleton Estate Rum Tour is located on the South Side of the Island, approximately two hours drive from Montego Bay, one and a half hours drive from Negril and two hours from Ocho Rios. On a guided tour, you learn about the history of rum making. After a bit of rum history, starting with the days when sugarcane was crushed by donkey power, tours then progress into the modern factory, where one of Jamaica's best-known products is bottled. After the tour, samples flow freely. Complimentary bottle of Rum for every visitor. Rum tasting in the air-conditioned Appleton lounge. There's also a good restaurant here serving genuine Jamaican dishes. The first known documentation of rum production at the Appleton Estate dates back to 1749, however the origins of the Estate date back as far as 1655 when the British captured Jamaica from the Spaniards. Frances Dickinson, whose grandsons are the earliest known owners of the Estate, took part in that conquest, and it is believed that the Appleton Estate was part of the land grant that Dickinson received as a reward for his services. Nestled in Jamaica's Nassau Valley in the centre of the island, the Appleton Estate covers over 11,000 acres of land. The magnificent rums that are produced on the Estate are of a unique style produced only in Jamaica and only at Appleton . These rums are a legacy of days past when our ancestors developed. In the 15th century, Spanish settlers introduced sugar cane cultivation and the art of distillation to Jamaica . With fertile soil and a perfect climate, Jamaica proved to be ideal for the grass-like sugar cane to flourish. Initially revered for the sugar that it produced, it was soon discovered that a stimulating alcoholic drink could be made by fermenting, then distilling the thick and sticky brown substance that remained after the sugar was extracted from the cane juice. 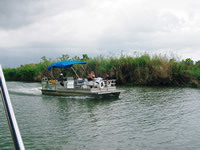 Pristine mountain springs and underground aquifers of limestone filtered water were used for rum production. Shortly afterward, many of the English, French and Dutch colonies in the West Indies also began experimenting with distilling sugar cane juice. By the 17th Century, there were distilled spirits throughout the region and Jamaica gained the enviable reputation of being the source of the finest rum in the world.